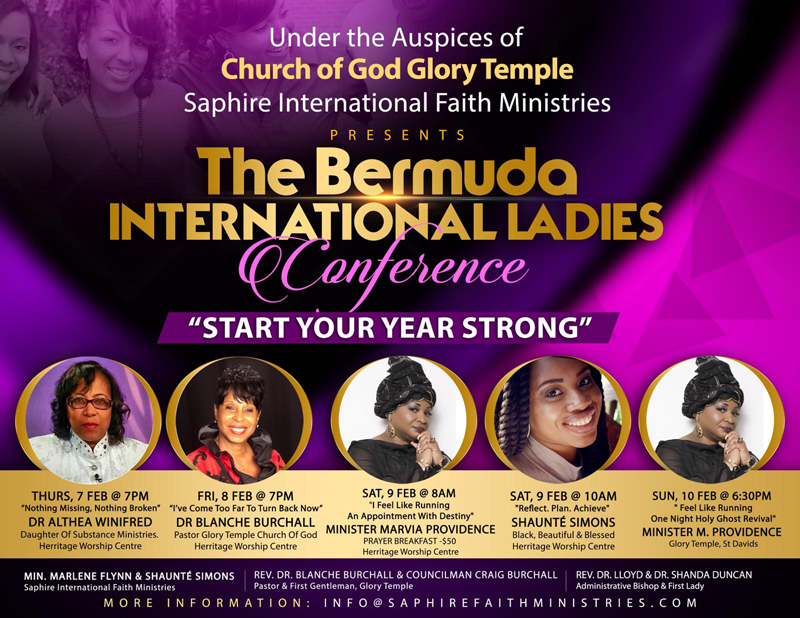 Saphire Faith International Ministries [SFIM] will be hosting the Bermuda International Ladies Conference from Thursday, February 7 to Sunday, February 10. 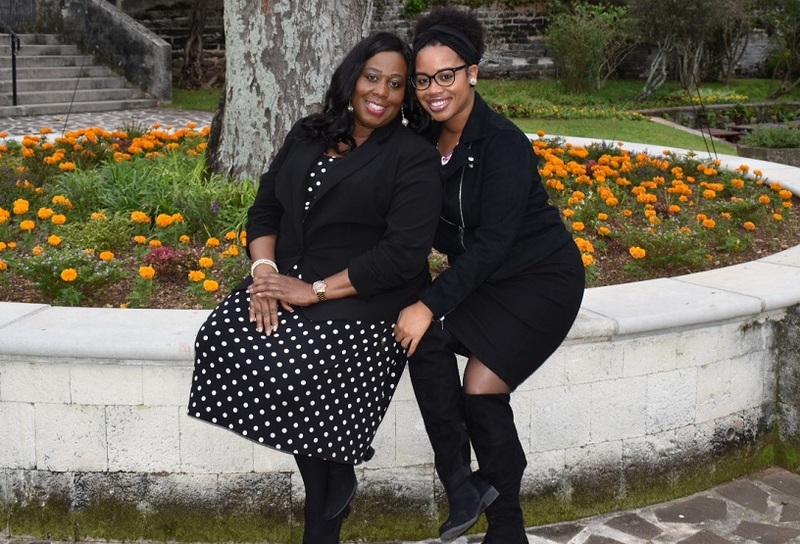 Mother and daughter duo Marlene Flynn and Shaunte Saphire Simons have a close relationship, and said that they believe that God has called them into a mother-daughter ministry, Saphire Faith International Ministries [SFIM]. Marlene and Shaunte said, “What it is not – SFIM is not a church or denomination. It is an inter-church conference and women from all religious denominations are welcome. There will be choirs, praise teams, liturgical dancers and flaggers from all across the island and from various denominations ministering at the conference. “It is a ministry that aims to enhance the lives for women inside and outside of the church. Women, the nurturers in our community are so very busy meeting the needs of others that we forget that we too need ministering to, we too have needs that need to be met. “We need to step back and ask ourselves, ‘Am I meeting my full potential – am I meeting the desired goals that God has for me? Or am I too busy meeting the needs of everyone else? We often times forget our individual purpose. We need encouragement to sustain us regardless of the role we play in life. As we pour out, we need to be refilled so we do not become burnt out and resentful for giving so much. Thursday, Feb 7th at 7:00pm – “Nothing Missing, Nothing Broken” – Dr. Althea Winnifred, Daughter Of Substance Ministries. Dr. Althea is a Bermudian who resides in Atlanta. She is the author of several books including – The She Within You. “Friday, Feb 8th at 7:00pm – “I’ve Come Too Far To Turn Back Now” – Dr. Blanche Burchall is the Pastor Glory Temple Church Of God. Dr Burchall is an Author Of a Children’s Book – What Children Thought About God During Hurricane Gonzalo. “Sunday, Feb 10th at 6:30 pm – Feel Like Running, One Night Holy Ghost Revival which will be held at God Glory Temple, where Marlene and Shaunté attend church. “These are powerful themes that God has given us for his people. Each theme highlights the expectation of what God will reveal in that service – we will leave there empowered, equipped and ready to pursue our God given passion – our true purpose,” the mother daughter duo said. “We cannot start our year strong without doing first things first which is to tap into hearing what direction God wants us to take. “We want women to be transformed through the word of God – that is the mission of SFIM. We want them to be inspired and encouraged on their spiritual journey and that will enable them to live more successful lives. “Our desire is that each woman, after hearing from God through His Holy Spirit, to be able to set the atmosphere over their own lives, declare and decree what they want their next 10 ½ months to look like. Start Strong – Finish Strong! “This conference is very timely for Bermuda. A lot of people have encountered severe hardship and disappointments, loved ones passed away, just a lot of curve balls that life has thrown our way. A lot of people are really hurting right now and they are really hoping and looking forward to a better 2019. “This conference is our baby,” they added. “We are grateful to have received the blessings of our Bishop, Rev Dr. Lloyd E Duncan & First Lady Dr. Shanda Duncan and from our Pastor, Rev Dr. Blanche Burchall and Councilman Craig Burchall, to launch this Ministry, under the auspices of Church of God Glory Temple. We want to thank, in advance, everyone that is connected to the success of this conference. “Our mission is to transform the lives of women through the Word of God and we hope to inspire women to embrace the mantle that God has placed on them which will enable them to move forward for the Glory of God. “We want women to be successful in all areas of their lives – physically, mentally and spiritually – and to be emotionally sound. Our events will touch on all of the above areas to enable women to be and feel whole. “Perhaps a mother and daughter relationship has gone sour and need healing – we can point them in the right direction to get help. Perhaps this daughter will gift her mother a ticket or visa versa – you never know what God is up to, we just need to avail ourselves because with God all things are possible. “The only ticketed event is the Conference Prayer Breakfast – $50. There are two sessions [i] “I feel Like Running – An Appointment With Destiny” presented by Minister Marvia Providence and [ii] Reflect, Plan, Achieve presented by co-founder of SFIM, Attorney, Shaunté Simons. Shaunté has just written an e-Journal/book from which she is making her presentation on the same day. For more information, please call or text. before 8:00 am and after 6:00 pm, at 704-0145 or 704-1045, email info@saphirefaithministries.com, Facebook: @saphirefaithministries or Instagram: @saphirefaithministries. Wonderful ladies! Looking forward to this!